Here are some thoughts to chew on – six points that I think are worth considering about hand embroidery. 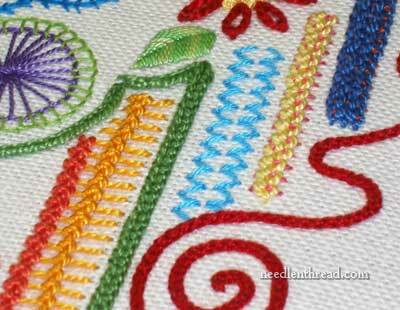 Hand embroidery is an easy and pleasurable skill to learn, if you have an interest in learning it. The ease with which you learn is proportionate to the interest you have in the subject. 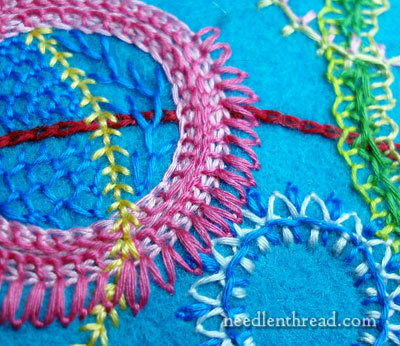 However, interest does not equal easy in every aspect of hand embroidery (or really, in learning anything)! 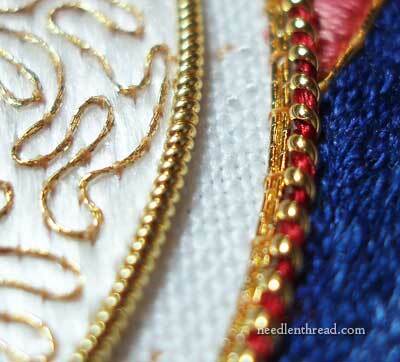 The more enthusiasm you have, the more likely you will persevere through more difficult aspects of hand embroidery. There are hundreds and hundreds of hand embroidery stitches, most of which cannot be duplicated by machine. There are also hundreds and hundreds of embroidery techniques, styles, and regional-specific traditions. Hand embroidery is a unique, personal, and very human art. Basic hand embroidery is inexpensive to undertake and accessible to most economic levels. However, like all hobbies, arts, and crafts, hand embroidery grows in cost proportionate to the techniques pursued, the supplies accrued, the skills achieved, and the time invested. Certain hand embroidery supplies are expensive because of the quality and scarcity of raw materials involved, the skill and time required to make them, the limited and specialized market available for them, and the risk and investment involved in making them available. Yet even considering the costs of fine and specialized embroidery threads and specialized instruction in hand embroidery, hand embroidery instruction and materials are more widely accessible today to people in every walk of life than they ever have been in the history of hand embroidery. The most valuable aspect of hand embroidery is Time. Time implies two things. It obviously implies the literal passage of minutes, hours, days, weeks, months, and years that we put into accomplishing something. Time further implies the love and care we have for something, whether it’s embroidery or anything else. We do not, by nature, put a lot of time into things we do not love or care about. If we love or care about something, we will devote more time to it. So our Time is valuable, not only because it is our time and we can never get it back, but also because it implies the love we have for something. In relation to the value of Time, the cost of good and appropriate materials for a given project is negligible, even if the materials are expensive. Investing in the right tools and the right materials (good quality fabrics, threads, needles, and so forth) increases both the pleasure of the experience and the outcome of the embroidery. It is always well-worth investing in the best tools and materials one can afford. This point implies an opposite consideration: that poor quality materials and the wrong tools can make embroidery frustrating and can often impair the outcome of even the heartiest of efforts. Although there are specific ways to make individual stitches, and although there are embroidery methods that are more efficient or more logical than others, there is no “one right way” to do specific types of hand embroidery. General methods in different hand embroidery techniques vary between instructors, between books of instruction, and between “schools of thought” in embroidery. Once the foundational concepts are learned, the individual has much freedom for interpretation. What do you think? Feel free to comment below if you have any further thoughts to share, or even if you want to take me to task for any of the above! Seriously. On one of my ongoing projects, my boyfriend commented on how slow it was going and I was like, no it’s not look there is an ear and a cheek bone,lips, and part of a nose, it’s going pretty fast! I thoroughly enjoyed your comments about Hand Embroidery. Thank you! For Consideration #3 – Cost – One also needs to factor in the cost of Hand Embroidery classes, workshops, tours, cruises, etc. Ask me how I know this. . . Wonderful! I love it. I would add: And we have available to us people like you who generously share their love of embroidery with their enthusiasm and knowledge. Thank you. Well said! I particularly enjoy this aspect of handwork. There are many ways to approach a hobby, mine with embroidery is to spend as little as I can and derive as many hours of fun from it as I can. I own, two hoops, one kit of needles and one kit of 100 floss skeins. With that I mostly embroider on promotional tote bags, covering the promotional logos and text. I usually don’t follow a pattern, i just scribble something and stitch away, willy nilly, usually choosing a stitch to learn in the process, so far I learned long and short stitch and chain stitch, I am looking for a tote to practice french knots, next. It can take me more than 30 hours to finish one, it costs me almost nothing and makes me very happy. I agree! Due to epilepsy my embroidery budget is a jar that I collect pennies in and that is the most it has collected in 1 year is about 32$ but 23$-25$ a year is average. I also have a “my way” approach to embroidery. I have a “grab and go” basket for my tools and projects. The “my way” projects cost less than even the cheapest kits available at Michaels or Hobby Lobby and I can do a few large (3 months or more at 3 hours or so a day) projects a year, instead of just one kit a year. “My way”, is just the cost of the fabric, plus a few dollars worth of DMC that I can buy long before I even plan to start. The (cotton) fabric is bought on sale and with a coupon (one of those % off entire purchase including sale items dealies) only, and almost always yanked out of the “ends” bin at the fabric store, and buy floss purchased twice a year when my local craft store sells thier stranded cotton DMC for 25c each instead of the 36c it is normally. I (mostly) get patterns from pictures my father has taken or from books my grandmother left me over a decade ago. My parents enlarge and print them for me, and I use my light box to put them on the fabric. I do not draw them myself because I failed art in college. (Yep! Long story, but in a nutshell, the teacher wanted to teach everyone to draw primarily humans and I took it to learn to draw things I could embroider.) I do have a tiny stash of extra DMC, leftover from past projects that I purchased too much for, but that is it. French Knots next huh? Try a pattern with cattails in it, they look like french knots already! Mary, I am about to teach a beginners class in hand embroidery in October and I would very much like to use some of the above in my introduction. I absolutely could not say it better myself. With your permission of course and giving credit where due. “Take you to task”–why, kill the messenger? All of the “considerations” gives to us hours of pleasure, sometimes frustration, but usually a good feeling of accomplishment, even if it’s mastering a difficult stitch in practice. Just wanted to tell you that I LOVE this blog! Me too. I love this blog. New to this hobby and I’m thankful that I have this blog to go to if I have a question or need instruction. This is a very interesting article. I enjoyed it very much. I do love most all of your articles but this was just perfect to explain why hand vs. machine embroidery. Thanks for taking the time to write it. Excellent post, Mary, and you bring up a lot of really good points. Love the pictures, too! I was just wondering about the fish photo..could you share with me more about that. 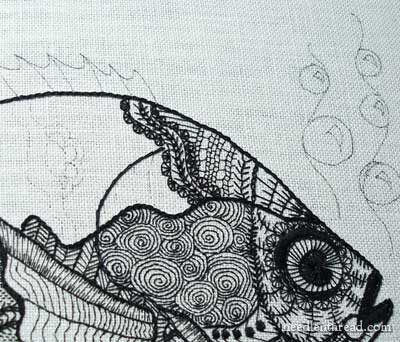 I love the way the fish is filled in with all sorts of different stitches..is that blackwork? I like the plain design like a pen and ink drawing. I want to second your comment about time. When I hear someone complaining about the cost of fabric or tools or supplies, I just shake my head. When I spend 8 hours on a very simple redwork block, the supply cost was minute! My joy and pleasure was worth so much more! Just make sure you are spending your time doing something you love – if you don’t like it – start a different project!!! Life is too short to work on something you don’t like! This installment has reminded me to dig out my “flattening tool” or whatever it’s called to keep my threads from getting all twisted and bunched when I’m trying to to satin-fill-in spaces. I have to spend a week dog/house-sitting for my Son and his wife and am gathering together things I’ll need to keep busy. It does remind me of a question I’ve been meaning to ask you though. 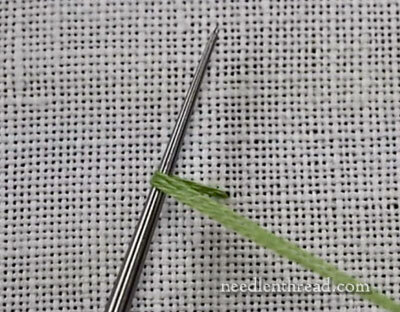 On the subject of keeping the threads nice and flat and smooth, what are your thoughts on “Separating” all the threads before you put them into the needle to commence work ? Is it a whole lot of unnecessary bother ? or is it worth it to take the time ? And should we do it ALL the time ??…Thanks.. Yes, “stripping” the floss is absolutely worth it, unless you are purposely stitching with all 6 strands of floss as if it is one thick strand. But in any other case, definitely strip the floss first. It fills out the stitches much better when it has been stripped and put back together. This holds true for stranded cotton, stranded silk, soie de Paris – any thread that is meant to be divisible. There is also an aspect of #3/4 that you didn’t mention. That is, acceptance of your financial situation. You have to accept your own budget limitations, and not just like embroidery if you can only do expensive projects. I admit, trying wool floss has interested me, but my budget does not allow it and that is unlikely to change, so I have to be happy to stick to stranded cotton. Yes, it is true that if you divide cost by hours of pleasure the cost could be negligible, but you still have to be able to afford the initial smack of 75$-200$ or more when a high-end kit is involved. Sweetie, you have inspired me in more ways than one; as possibly helping others. I’ve come up with some ideas to submit to my church on how to better use their time while engaging in something ‘real’ and not just using up their time. Some people are lonely and ‘just’ filling up that time… I’ve got some ideas now. I could add another one: it makes me happy. I get an enormous sense of wellbeing and satisfaction (generally,… almost always) out of stitching. No idea how you would put a price on that. And there’s always another project to drool over. Thank you for your excellent article. It is so well written. Yes everyone has a budget, but using the best materials one can afford is excellent advise, because TIME is so valuable and people should remember that. Interesting points! I agree with them all. But I am writing because I really like the fish embroidery shown just before #6 and I wondered if you have the pattern available for it. Thanks for responding. I want to reiterate the fact that without people who generously share their time (like Mary) many of us would not have opportunity to stitch. While I had a mom who taught me, that is not the case any longer and without patient teachers we will have no one to stitch for us in our old age. I mostly do other people’s designs – cross-stitch etc. – so for me I don’t get the uniqueness aspect so often. What I do find is that embroidery is like a form of meditation. The stitches are easy and repetitive but require focus and are thus often accompanied by an emptying of the mind of other concerns. And you have the bonus of creating something in the process. I so enjoy your daily articles and instructions. Thank you for sharing your insights and expertise. Please keep it up! Thanks Mary. It is good for us beginners to have some affirmation about our hobby. It is also good to be reminded of the wonderful aspects of our craft. Thank you so much. I have not had any formal lessons and learnt most of my embroidery from your site and your videos. You always give me confidence to try something even if it is outside my comfort zone. Just a couple of words to the wise – ‘Thank you’! Great post, Mary. In crazy quilting, we often find newbies complaining that their stitches aren’t perfect. I point out first that practice will take improve their work, but that I value the little wobbles and wiggles of hand embroider. It lets me see the human hand in the work. I’ve also had people ask me if I plan to buy an embroidery machine someday. I say definitely NOT! I would never let a machine have that much fun. I forgot to say: It’s good to see the blackwork fish again. It’s one of my all time favorite projects. I absolutely adore it. Another great article and topic! All your considerations are valid and concise. The one consideration I hold dear for my hand embroidery is that it speaks of us; the person, the people who put their love, passion, learnt and practised, (and practised and practised) skills into their work. Long after we are gone our work tells people who we are, who we were, it carries our spirit through generations which would otherwise not know us. Stitching makes us Human and lets people connect with us. Yes, I’ve been told that I could go to a big box store and get a product that is much more “precise” at a fraction of the cost and time. My response is always that mass produced items of any kind may seem to be a more “logical” choice yet we are lost in that choice. Hand stitching is the continuity of lives, Humanity as well as techniques, supplies,and most of all ….meaning. I agree with your 6 points absolutely no need to take you to task at all. I love the stillness of mind that comes when you embroider, can’t put a price on that! Different subject altogether, I wish we could see the complete sample you have been showing us in bits in stitch play, can we please, please, please, pretty please??? what can i say that everyone hasn’t already said. for me, embroidery and your website have opened up a whole new world for me, where I am in tune to and appreciate and notice color, form, texture, space, placement. I love everything about it, and as another reader said, when you put a stich in, it will be there tomorrow. Thank You Mary for mentioning the elephants in the room! Poor quality materials often deliver lackluster results–fuzzy floss that’s hard to stitch etc. Conversely, quality materials rarely yield poor results & are often easier to work with. So for beginners & the budget-minded, make an informed decision to selectively acquire “the best” that you can afford when you are able. One of the ways is to join a needlework group. EGA chapter programs often feature reasonbly priced projects by using exquisite threads in small amounts. Also, chapters sometimes sponsor swaps & “stash clearing” events, some of which are open to the public. In the past few years, a large number of silk/metal, blackwork, sampler kits etc. were “gifted” to other members in my chapter & all of them included the linen & threads. On the subject of uniqueness of hand embroidery–you are preaching to the choir here! But–for the next gal who approaches me at a demo, looks over my crazy quilted items & says–“Oh, I can do that at home on my Bernina!” I wish her a long & frustrating power outage!! She’s beyond help. 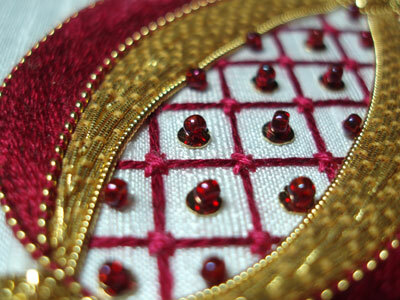 I enjoyed your comments on 6 reasons to consider hand embroidery. Where can I find the fish pattern in the article? Loved your didactic breakdown of the rational for our passion. We also enjoy the wonderful relationships that develope while sharing our interest with people from all kinds of backgrounds. It also is a constant opportunty to grow and explore. Getting involved in helping others through the use or demonstration of our work is also rewarding. Well done, Mary, I couldn’t have said it better myself, lol. There seems to have been a bit of discussion around lately about this sort of thing which can only be good. I do feel sorry for people who are unable to afford to go out and just buy everything and anything they want to stitch with, but have pity for us in Australia – where you pay 36c for a skein of DMC cotton floss, we pay $1.25 and our dollar is fetching over a dollar of yours. Where is the justice in that? The idea that we should use the best quality materials we can afford is an absolute truth and probably my favourite of your list. It reminds me of when I started using watercolours for painting. I bought student quality paints and did a project with them when I was studying architecture but my project was not very good (actually pretty awful). Another student’s work was very good so I asked her about it and her advice was to throw out the paints and buy 3 or 4 artist quality tubes. She was right, and the same applies across the board. I am inspired by your website! I spend my winters volunteering, teaching hand sewing and embroidery to underprivileged children in Cambodia. Basic materials are either scarce, expensive or not available there, especially embroidery floss. The first year I taught, we used sewing thread, doubled, and last winter, I brought floss which was quickly consumed! Oh, ’tis true, ’tis true! Every word of it. Thanks for this blog. You forget to mention #7 Mary Corbet and Needlenthread, your brilliant and helpful site, without which I think I would have given up on hand embroidery. You inspire me everyday and you have helped me no end to aspire to perfection in hand embroidery, even though I haven’t reached perfection yet, the fact that it is achievable because of your encouragement and enthusiastic approach to hand embroidery and your concept that anyone can sew. Tiene toda la razon,gracias por estos consejos y es muy claro que debemos darle valor a nuestro trabajo ademas de poner las mejores herramientas. You’re certainly right, thank you for these considerations and it quite clear that we should value our work in addition to using the best tools. Embroidery is a way of relaxing and stress relief. It encourages you to be productive and inventive and the biggest is a feeling of satisfaction. Unfortunately not everyone agrees but I think it adds to a home feeling homely with a feminine touch. I’m always greAtful for anything ican Leeann. One regret I have is not taking advantage of my teacher at school, I could have learnt a lot more if I had taken it more seriously.